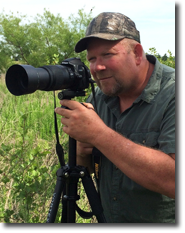 My name is Mike Brown and I have long been a fan of all the beautiful birds and wildlife we have in North America. I fell in love with taking pictures of native songbirds when I was just a teenager and after all these years the passion I have for it still burns as strong as ever. There is just something magical that happens when you capture a special moment in the life of a wild creature and that is what I have in my mind anytime I am behind the lens of my camera. I want my pictures to show the Birds and Wildlife at their most beautiful and I strive for that when I set out to capture them. I live with my lovely wife Juliana in the magnificent rolling countryside of western Kentucky and I have two wonderful children Stephanie and Jonathon. Capturing the Birds of North America to me is not about getting a great picture. To me it is about Art and my great love of our beautiful American Birds drives me to capture that Art. For addtional information you can contact me at sales@vmbrownphoto.com.